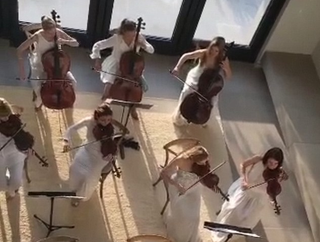 Kanye West Got Kim Kardashian a String Orchestra For Mother's Day, And What Have YOU Done? Most moms are content to spend Mother’s Day being doted on by their well-meaning families: The sloppily-served eggs in bed, the unintelligible drawings, the poems with rhymes so tortured you can hear them scream. Annie is about a girl rescued from a tough life in an orphanage by a rich benefactor named Daddy Warbucks, and “Tomorrow” is a number that Annie sang in front of FDR, for some reason. How either of these themes are relevant to the Kimye clan is unclear, but that doesn’t mean we shouldn’t commit the remainder of the day to wild speculation.